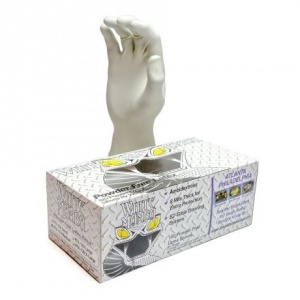 The White Mamba Disposable Latex Gloves BX-WMG are a sister design to the Black Mamba Gloves which have become renowned in the hand safety market due to their specialist properties which have made them an industry favorite. Ranging from the oil to chemical industry, the White Mamba Disposable Latex Gloves BX-WMG are designed for use with slippery chemicals and offer increased thickness. This reliance is in part due to the superior strength and tear resistance of the gloves which allow the user to rest assured that they are using one of the toughest gloves on the market, these are also particularly good when dealing with wet or slippery chemicals. The White Mamba Gloves arrive in a box of 100 gloves, they are available in sizes ranging from S to L.
Thinner - With a thinner design the White Mamba Disposable Latex Gloves BX-WMG are ideal for vehicle workshops or garages. Patented NITREX Polymer - This specific property enables the White Mamba Gloves to achieve superior strength and tear resistance. Motor Mechanics, Tyre Fitters, Plumbers, Oven Cleaners, Exhaust Fitters, HVAC Engineers, Cycle Mechanics, Vehicle Body Shops, Decorators, Automotive Engineers, Waste Management, Chemical Engineers, Maintenance, Water Treatment and Agricultural Engineers. Within the mechanics and vehicle repair industry the need for a strong tough glove is essential. Whether it be dealing with changing a vehicle part or a customer, the White Mamba Gloves allow the user to be made aware of any lubricants present very early on. Part of the reason for this is that the gloves are white this enables any spillages on the gloves via oil to be transparent when dealing with customers. Alongside this reason is that the gloves have in place NITREX Polymer technology which provides increased strength and dexterity reducing the risk that you will puncture/tear the glove because you are able to feel the sharpness of a tool or part before penetration through a glove. When working within the oil industry it is crucial to use a pair of gloves which provide some form of increased grip resistance. With the White Mamba Disposable Gloves you will not be disappointed in this sense, with technology offering increased grip and hold you can be assured that your tools are less likely to slip out of your grasp. Please note, all working environments and circumstances differ from place to place and therefore the information above should only be used for advisory purposes and not taken as instruction. The 'White Mamba Disposable Latex Gloves BX-WMG' are available in the following sizes: S, M, L.
If you are in any doubt about your sizing then please contact us on 020 7501 1104 beforehand as once the box is opened we will not be able to accept a return of this item. I bought these gloves initially to wear when inspecting my bees, this type of glove is great as they are white and have no smell plus sting stays on top of glove if get stung. Also great for gardening, the soil doesn't penetrate through them. A good all round glove.